Welsh electrical engineering pioneer Sir William Henry Preece advanced the development of telegraphy, telephony and radio. He devised block signalling for railways, brought the first telephone into Britain, and encouraged the uptake of electric lighting and power. A genial man and an enthralling speaker, Preece held many high professional offices, including the presidencies of the Society of Telegraph Engineers & Electricians, the Institution of Electrical Engineers and the Institution of Civil Engineers. Preece worked briefly under Michael Faraday (1791-1867) before pursuing telegraphy at the Electric Telegraph Company, the Channel Islands Telegraph Company and the London & South Western Railway. He spent most of the rest of his career as a "member of the great Civil Service of this country". He was a mainstay of the Post Office, which was a government department at the time and in charge of communications. He was also a partner in the electrical engineering consultancy that became Ewbank Preece (now Mott MacDonald). In July 1877, Preece brought telephones into Britain for a meeting of the British Association for the Advancement of Science, held in Plymouth. They were demonstrated to Queen Victoria (1819-1901) in 1878. He then worked on conduction systems for wireless communication. In March 1882, he managed to transmit a signal across the Solent, between Southampton and the Isle of Wight. Working with Arthur West Heaviside (1844-1923) in 1885, he discovered radio induction effects between parallel telegraph wires and an unwired telephone receiver. Four years later, he sent a signal across Coniston Water, Cumbria, followed by greater distances — over the Bristol Channel (from Lavernock Point in 1892) and over Kilbrannan Sound in 1894. The following year, Guglielmo Marconi (1874-1937) developed a more effective system of radio telegraphy using Hertzian waves, and he found an ally in Preece, who let him use Post Office facilities for his experiments. In April 1898, Preece realised his "greatest ambition" and became President of the Institution of Civil Engineers. The following year he was created a freeman of his home city of Caernarfon. 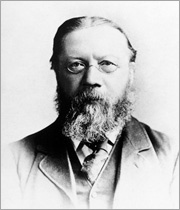 Professor William Edward Ayrton (1847-1908), outgoing President of the Institution of Electrical Engineers declared, "my successor ... is undoubtedly the most popular man in the whole engineering profession". He was popular with governments too. The French appointed him to the Légion d'honneur and he was knighted by Queen Victoria in 1899. Preece sought simple uncomplicated solutions to practical problems, and he encouraged his assistants to take on responsibility. He published prolifically — including Telegraphy (1876, with James Sivewright), The Telephone (1889, with Julius Maier) and A Manual of Telephony (1893, with Arthur Stubbs) — and delivered lectures in his "superb voice". After his death, the American Institute of Electrical Engineers lamented that "the electrical engineering fraternity of all lands have lost a friend". In his presidential address to the Institute of Electrical Engineers (now Institution of Engineering & Technology), he had noted that over the previous 40 years, the total length of telegraph cables laid worldwide had increased from 161km to 258,528km. 1898-9 President of Institution of Civil Engineers, delivers James Forrest lecture (1900). 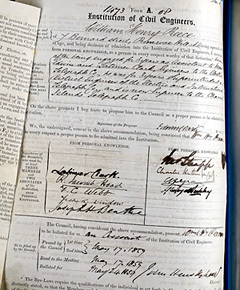 Preece was elected a Member of the Institution of Civil Engineers on 17th May 1859. The records shows him as living at 7 Bernard Street, Primrose Hill in London. Th proposers include brothers Edwin and Latimer Clark, engineers at the Electric Telegraph Company, where Preece was their assistant. 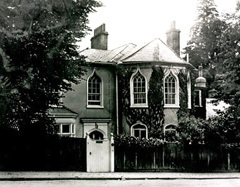 Grade II listed "Gothic Lodge", Woodhayes Road, Wimbledon, Preece's London home from 1874 onwards. It was constructed c.1760 (or possibly 1785 by John Lawson) and extended c.1880-90. Thanks to Preece, it was London's first private house with its own telephone and electricity supply. This 1913 photo was taken by Cicely Cardew, daughter of Major Philip Cardew (1851-1910), Preece's business partner in later years. 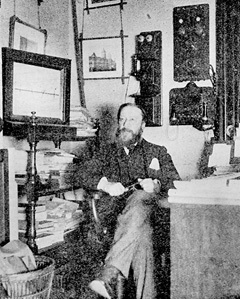 Preece at work in his office at the Post Office (once a government department, now British Telecom, or BT) on 4th December 1892. A composite image of photographs taken at the 1900 Exposition Universelle de Paris (15th April to 12th November 1900). 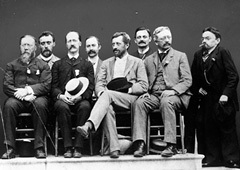 The electrical engineers shown include (left to right, front row) — Preece, Silvanus Phillips Thompson (1851-1916), William Edward Ayrton (1847-1908), Alexander Siemens (1847-1928) and Charles Proteus Steinmetz (1865-1923). 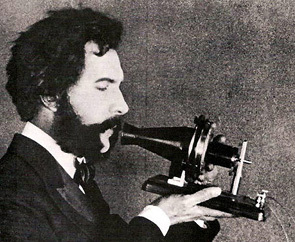 Alexander Graham Bell (1847-1922) using the first telephone. Bell was born in Scotland, emigrated to Canada in 1870 and moved to the USA in 1871 to teach in a school for the deaf. A US patent was granted to him on 7th March 1876 for the telephone. Preece acquired an operational example from him in 1877. 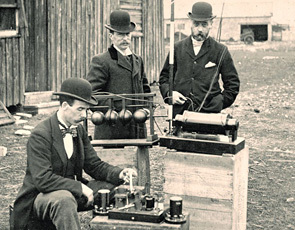 Post Office engineers inspecting Gugliemo Marconi's radio (wireless telegraphy) equipment during a demonstration, Flat Holm Island in the Bristol Channel, 13th May 1897. Marconi's transmission from Lavernock Point in Wales to Flat Holm was the world's first over open sea. Preece had allowed Marconi to use Post Office facilities in London for his experiments, and he too had used Lavernock for trials. He was an observer during Marconi's tests here. 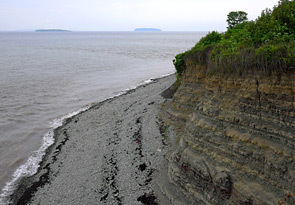 Looking southeast from Lavernock Point, County of Cardiff, to Flat Holm Island (on the left), about 6km away in the Bristol Channel. Both Preece and Marconi used the point for telegraphic transmission experiments. There is a small masonry building on the point but it's unclear whether either actually used it to house their equipment. In 1891, Preece attended the Internationale elektrotechnische Ausstellung (electro-technical exhibition, 16th May &endah; 19th October), Frankfurt am Main, Germany. It was supplied with electricity from the world's first three-phase power plant, 175km away in Lauffen am Neckar. The photograph was taken on 12th September 1891. From foreground left — Professor Dr Dietrich, Baudirektor Karl von Leibbrand (1839-98), Innenminister Johann von Pischek (1846-1916), Dr Otto Arendt (1854-1936), unknown, Emil Rathenau (1838-1915), Marcel Deprez (1843-1918 ), Colonel Emil Huber (1865-1939), Preece and Oberpostrat Ebert. 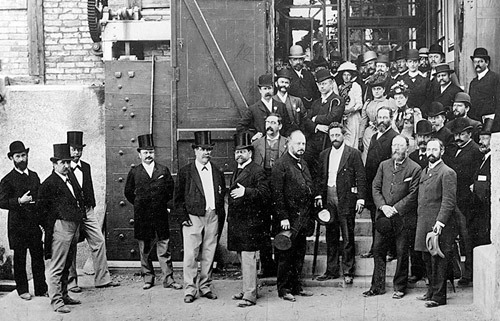 Gisbert Kapp (1852�1922) is behind Rathenau, Charles Brown (1863-1924) is behind Preece, and Dr John Hopkinson (1849-98) is at rear left (in bowler hat).